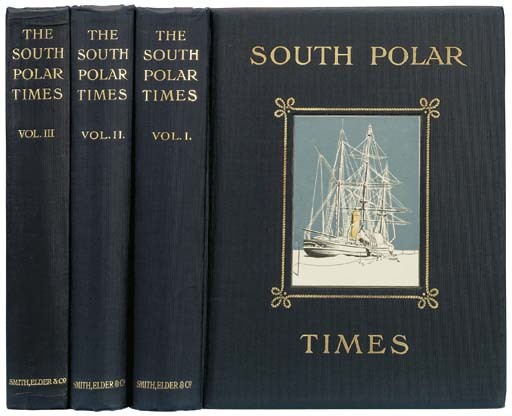 The South Polar Times. London: Smith, Elder & Co., 1907-1914. 3 volumes, 4° (275 x 210mm). Titles in red and black (vols.I-II), text and title in ochre and blue (vol.III), plates and illustrations, some chromolithographed, after Herbert Ponting, Edward Wilson and others. (Occasional light spotting.) Original blue cloth, spines lettered in gilt, the upper covers with gilt lettering and rope-work surrounding centrally-placed inset pictorial cloth panels, g.e. (head and foot of spine of vol.III slightly bumped).